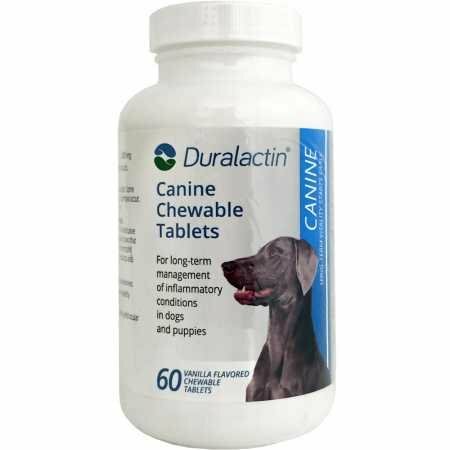 Duralactin Chew Tablets For Canine - Vanilla Flavor Save even more with this 2-Pack of Duralactin (360 Tablets) Stop inflammation before it starts. New immuno-nutritional aid for the management of chronic inflammatory conditions including osteoarthritis and soft tissue injury in dogs. Ideal for long-term use. May be used as a primary supportive nutritional aid to help manage inflammation or in conjunction with NSAIDS or corticosteroids. High in milk proteins. Low lactose content. Easy dosing schedule. Highly palatable, vanilla-flavored tablet scored for easy dosage. Each tablet contains 1000 mg of MicroLactin (Milk Protein Concentrate). All ingredients are food grade. Now, you can prevent inflammation in your canine friend before it even starts. Duralactin Canine is a cutting-edge immuno-inflammation aid that supports the health of your dog's joint and tissues. It can be used on its own as a nutritional supplement to help prevent and manage inflammation, or it can be used along with NSAIDS or corticosteroids. Its ingredients are all food grade, and the gentle recipe makes this medication ideal for long-term use.Every tablet is full of invaluable milk proteins like 1000 mg of MicroLactin (Milk Protein Concentrate), but you'll never have to worry about tummy aches as these tablets are also low in lactose content. The easy dosing schedule means that you will always remember to give your dog a dose while the great flavor says your dog will never resist. Each highly palatable tablet has an unbeatable vanilla flavor. Weight Dosage under 40 lbs. 1/2 tablet twice daily 40-80 lbs. 1 tablet twice daily 81-120 lbs. 1 1/2 tablets twice daily. Contains MicroLactin®, a patented dried milk protein concentrate derived from hyperimmunized cows. Recommended for use as an immunonutritional aid for the management of chronic inflammatory conditions. Chewable vanilla-flavored tablets. For use in dogs only. 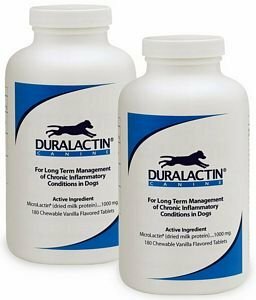 Save with this 2 Pack of Duralactin 180ct bottles. 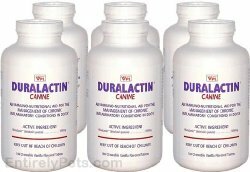 Duralactin contains a milk protein concentrate called MicroLactin that supports the long term management of chronic inflammation. Duralactin is not a drug or steroid but is a natural product derived from milk. MicroLactin is a patented special milk derivative that works differently than NSAIDs or steroids. Duralactin can help relieve the clinical signs associated with inflammation and help your pet live a more comfortable and active life. It can be used on its own as a nutritional supplement or along with NSAIDs or corticosteroids. Each tablet contains 1000 milligrams of MicroLactin and has a reduced risk of digestive issues as these tablets are low in lactose content. An easy dosing schedule and a great Vanilla flavor dogs love make it easy to give. Dosage is by weight; for dogs under 40 lbs. give 1/2 tablet twice daily. For dogs 41 to 80 lbs. give 1 tablet twice daily. For dogs over 81 lbs. give 1 1/2 tablets twice daily. Duralactin is not a drug or steroid but is a natural product derived from milk. It contains MicroLactin a patented special milk derivative that works differently than NSAIDs or steroids. Duralactin can help relieve the clinical signs associated with inflammation and help your pet live a more comfortable and active life. Stop inflammation before it starts. A new immuno-nutritional aid for the management of chronic inflammatory conditions including osteoarthritis and soft tissue injury in dogs. Ideal for long-term use. May be used as a primary supportive nutritional aid to help manage inflammation or in conjunction with NSAIDS or corticosteroids. High in milk proteins. Low lactose content. Easy dosing schedule. Highly palatable, vanilla-flavored tablet scored for easy dosage. Each tablet contains 1000 mg of MicroLactin (Milk Protein Concentrate). All ingredients are food grade. WeightDosageunder 40 lbs.1/2 tablet twice daily40-80 lbs.1 tablet twice daily81-120 lbs.1 1/2 tablets twice daily.